Many homeowners choose to remodel rather than start over, from scratch. 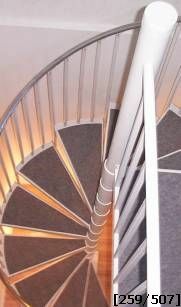 Stairways, Inc.’s standard bolt together spiral stair kits will make remodeling simple. Standard spiral stair kits arrive knocked-down. All spiral stair components can be taken indoors without the concern of tight spaces; unlike welded spiral stairs which ship in a couple of sections, and in most cases, require a 36” opening to walk through. Spiral stair kits can be taken inside piece-by-piece, if it is being installed upstairs, down a hallway or around a corner. Most standard spiral stair kits can be installed in less than a day and easy enough for a homeowner to assemble. For your next remodel project, whether you are the homeowner or a professional contractor, contact Stairways, Inc. Our staff can design a spiral stair to complement your project, structurally and aesthetically, and provide you with ease of use.